"Ooh, let me see!" A pair of bunnies has discovered a mirror - do they now know how cute they are? 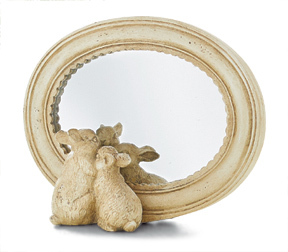 Two delightful bunnies and oval mirror with distressed finish and easel-back, 8 1/4" x 6".